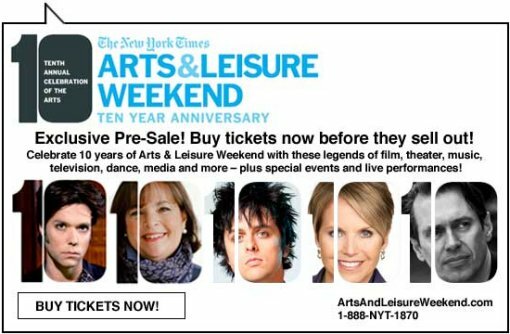 Tickets for the 2011 NYTimes Arts and Leisure Weekend are on sale now. Some of the highlights of this year’s A&L weekend include talks with Rufus Wainwright, Steve Buscemi, Terrence Winter, Billie Joe Armstrong and Lang Lang. View the full 2011 schedule after the jump. The two-time Academy Award-winning actor-director-producer is currently starring as disgraced former lobbyist Jack Abramoff in “Casino Jack” as well as serving as creative director of the Old Vic theater in London. The author of “The Shipping News,” “Close Range” and “Brokeback Mountain” is the winner of both a Pulitzer Prize and a National Book Award. Her latest book is “Bird Cloud,” a memoir. The brother and sister singers-songwriters-musicians talk about their music and lives and perform together on our stage. Few artists of our time have had the profound impact on their art form that the choreographer has had on dance over six decades. The 28-year-old superstar classical pianist has played to sold-out audiences throughout the world, including the New York Philharmonic on New Year’s Eve 2010. Terence Winter, the co-creator of the new HBO series and Emmy Award-winning writer of “The Sopranos,” joins “Boardwalk Empire” cast members Steve Buscemi and Paz de la Huerta. Interviewed by Charles McGrath. The vocalist/guitarist of Green Day and the director who co-wrote the Tony Award-winning Broadway musical “American Idiot” with him are joined by the show’s Tony Award-winning star, singer-songwriter John Gallagher Jr. Interviewed by Patrick Healy.